We are falling in love on Valentine's Day!! Thank you for the sweet surprise! oh the ear floof! Sooooo cute! Oh cuties! Best valantines gift ever. Btw, are they a bit bigger than the normal itty bitties who come by? Oh I have a weekness for pure white! 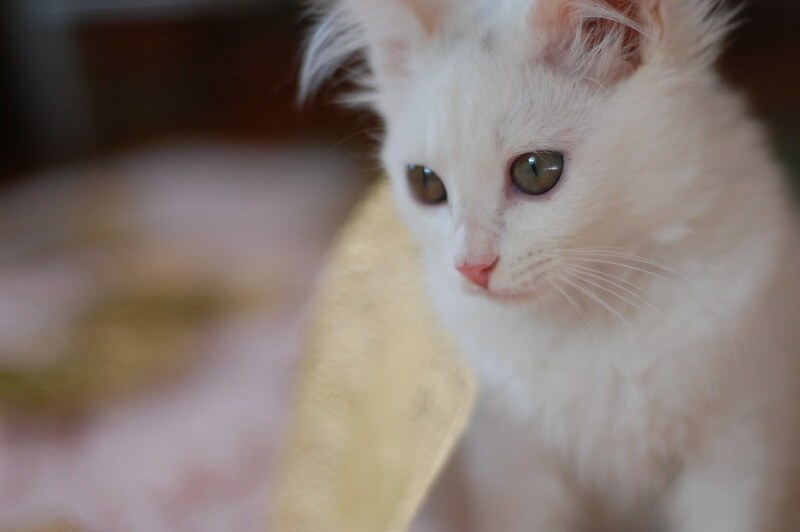 ?Turkish Angora mix? 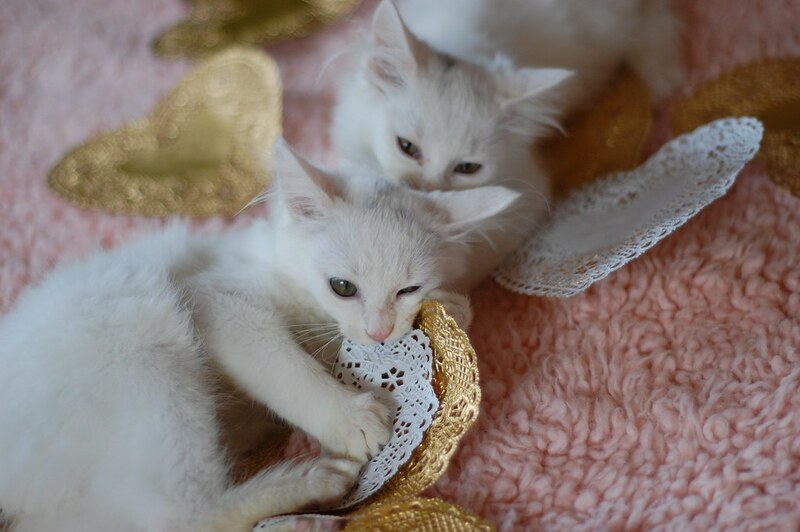 Lovely little kitties. I love their ears. What a wonderful Valentine gift!! The ear tufts.....ridiculous!! And their whisker span might even rival the Beans! /Hope it's not too obscure. Squeeee! I haven't stopped smiling since the last post! Beautiful furballs! I love the little sooty smudges on their heads. Awesome Valentine's present, for sure. That is some SERIOUS ear floof. Mind you, I'm not making judgements--I think it's adorable! Congratulations on the new recruits. 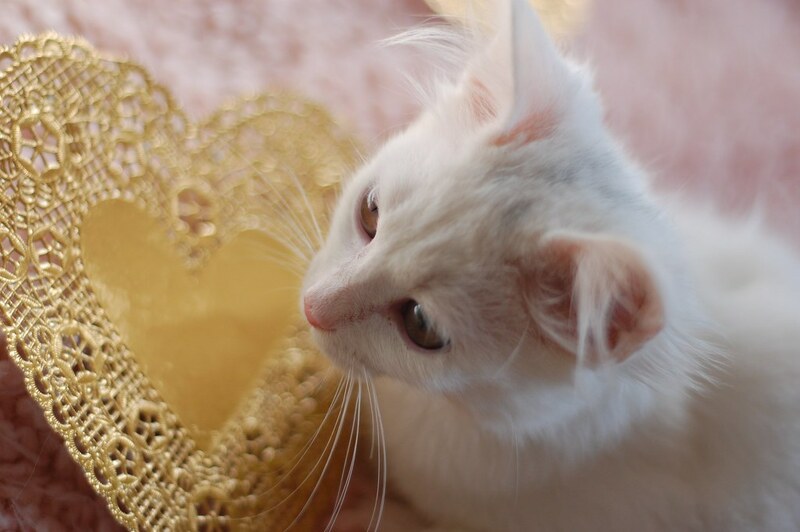 Very cute Valentine :) Thanks for sharing. 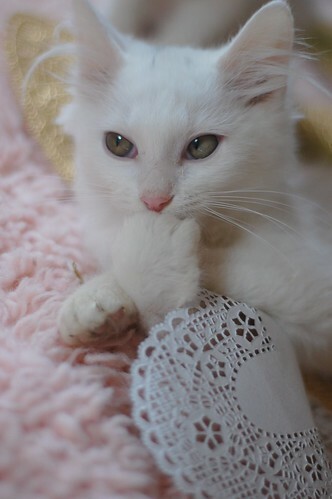 I showed my new foster Drewey--he's 15 and makes the same expression most of the time that she has in her sidebar photo. Those are some chunky looking feet too. Any spare toes? 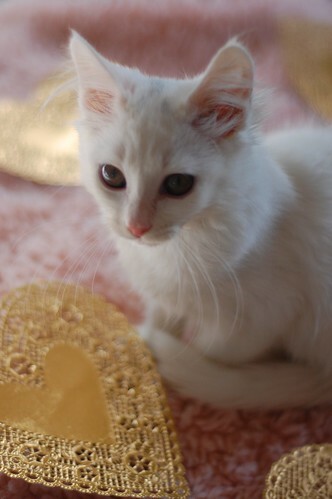 There's just something about those white kitties with the smudge of gray/black on top of their heads. My "Smudge" is named so because of hers, but as she gets older (about 6mos old now... may not make it to her first year if she continues to be such a brat... hehehehehe), it's gotten a bit fainter, but is still there. I was hoping that I wouldn't have to change her name. Oh my goodness! 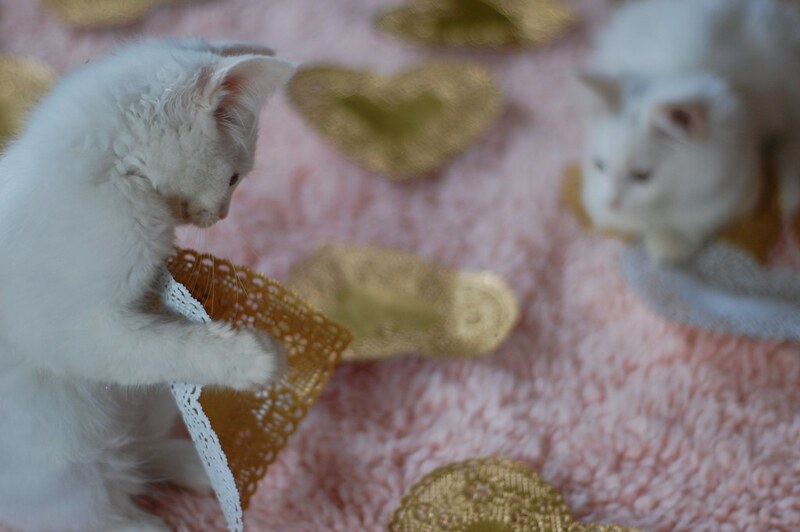 Such gorgeous kittens for Valentine's Day! They are absolute lovelies! How sweet these two are! I LOVE the 3rd photo, it looks like that kitten is being polite as\after a burp happens. How sweet! They remind me of a very sweet cat that I had years ago, little China. She was left on my doorstep when she was a tiny kitten, and I took her in. 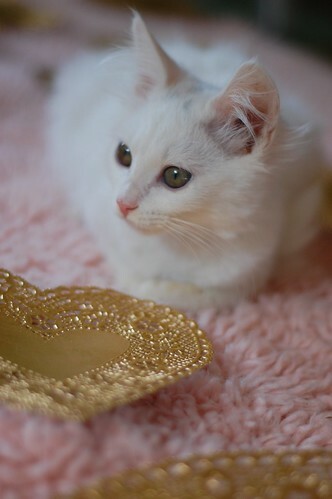 She was the daintiest of dainty little girl kitties ever, and sadly passed away at six years, but she was loved! Anne...No extra toes,, just big toes. Wow, just wait until they grow into their feet! Also I love their reaction to the hearts in the first photo. "What is this? I EATS IT!" i love love love you!!! definitely love at first sight! Oh my dear sweet Lord! These Spooners are beautiful bebes!